“Orbit Intelligent Engineering”, Found in 2004 by it's young & visionary founders Mr. Rakesh Patel & Mr. Nirav Patel ORBIT INTELLIGENT ENGINEERING is nowadays leading engineering company engaged in the Manufacturing of Best Quality Requirements for Fly Ash Bricks, Concrete Blocks Manufacturing & Autoclaved aerated concrete (AAC)Blocks Plant, Apart from this we also provide Concrete Block Turnkey Projects, ect. as well as Automatic Material Storage, Handling, Mixing & Feeding Systems. We export our products in various countries like Canada, Nigeria, etc. Since our origin, we are a Partnership firm which is actively committed towards providing high quantity range of products in several specifications. 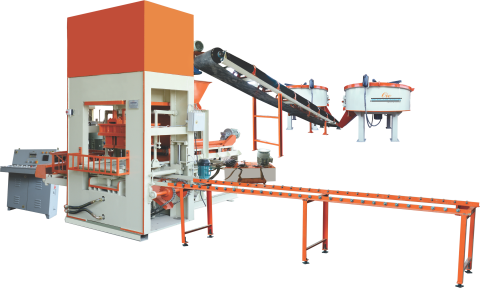 The Product range of Oie includes wide range of equipments like Automatic Fly Ash Bricks Plants, Automatic Concrete Blocks Plants, Autoclaved aerated concrete (AAC)Blocks Making Plants etc. Oie also offers Manual Machinery & Automatic Material Storage, Handling, Batching & Mixing Systems. ORBIT INTELLIGENT ENGINEERING is having its Manufacturing Facility at Mehsana town of Gujarat State in INDIA. The company is having the Facility of Fabrication Shop, Machine Shop, Design Section & Assembly Line to produce Best Quality Machinery. The Company is having well experienced team of Engineers & Workers who are well experienced & very familiar to standard manufacturing processes & work with Quality Practices to ensure Best Quality & Performance of Equipments. The Company is also having the team of Service Engineers to provide Best after sales services to the clients.